Before going into the framework, let’s talk a little about MVC (Model, View, Controller). For those who don’t know MVC, it is a method of separating the presentation, action and control layers of the application in order to achieve better and secure way of programming, and easier maintenance. All external calls (from the web URL) are directed to the Control layer. Then the Control will decide which actions to take, like performing a query, a calculation, etc… That is done in the Model layer, which has no access from the outside world. Then the Control will submit the results to the View (presentation layer) which will assemble the contents to the public. Basically, all public link addresses to your website will be calling the Control layer. All your queries and action pages will be in the Model, and all your display pages will be in the View, easy to find and maintain. Example: if you have to show a list of real estate properties, the Control will call a query in the Model to obtain the data and then call a display page in the View to show all the properties selected in the query. Fusebox is a methodology for developing web applications. It protects your application by forcing all calls to be made to a single template: index.cfm, which acts as the hub where all connections are made. By passing the “fuseaction” attribute, you will tell the Fusebox framework what action you want to be executed. So, with the analogy to the “electric fusebox”, the framework is divided into “circuits” and “fuses”. Your application folders are called “circuits” and the ColdFusion templates are the “fuses”. In this tutorial we will be referencing the Fusebox 5.51 XML version, not the non-xml one (sort of OO). Let’s start by downloading the Fusebox 5.51 Core Files, select the first link: Official FB5.5.1/CFMX core files (v5.5.1). Unzip the contents to a folder named “fusebox5” inside your web application root if you DO NOT have access to the ColdFusion administration site. Otherwise, extract the contents to a folder outside your web root and then map it as “/fusebox5”. Doing that, you will be able to have multiple websites using the same Fusebox core installation. Your Fusebox core structure should be like Figure 1.1 side. I know two ways of creating the MVC structure for a Fusebox application. One is most used by creating 3 folders: _model, _view and _controller (the underscores are for placing the folders on top of the other regular ones), and inside those folders we would put the Fusebox circuits. If you want to turn a circuit into a module that could be copied to other application, the better approach should be creating the circuits first, and then inside each circuit you create the folders “model” and “view”, being the circuit root itself working as the “controller”. if you want to prefix them with underscore “_”, since you will not have any other folder in the circuits. After creating all the necessary folders, we need to create empty control files in each folder. Those files will be named “circuit.xml.cfm”, which are XML files but with the extention CFM so they cannot be read by the browser without being parsed by ColdFusion. Just create the empty files for now. Figure 1.5 shows the new structure with the XML files. Do not worry about the empty files, we will fill them in later. I’m just preparing the application structure before starting coding. Now, let’s create the Fusebox required and optional files on the application root. Starting with the Application.cfc (capital “A”), fusebox.appinit.cfm, fusebox.init.cfm, fusebox.xml.cfm and index.cfm (create those empty files and we’ll work on them next. Your structure now should be like Figure 1.6. Let’s start now working on the Fusebox files on the application root. First of all, the Application.cfc component which is always the first to run on each request. You may have additional methods like onRequestEnd, onError… but right now we are interested in the Fusebox method: onFuseboxApplicationStart. That method is called when the Fusebox application initiates. It replaces the template fusebox.appinit.cfm in the application root. So if you may decide to use this method instead of that template, then it’s one less file to maintain. Now, here is the deal. Since the Fusebox core also has an Application.cfc with the same methods, we need to extend our Application.cfc to the Fusebox one and make use of the “call super” to invoke those methods first in order to use ours. On the first line, we extend the component. Remember to map /fusebox5 in your ColdFusion adminstration to the folder were you saved the core files. We basically wrote all the necessary code for starting with the Application.cfc, now let’s concentrate on the Fusebox template fusebox.init.cfm. It is included by the framework at the start of every request. It is included within a cfsilent tag so it cannot generate output. It is intended to be for per-request initialization and manipulation of the fuseaction variables. You can set attributes.fuseaction, for example, to override the default fuseaction. Fusebox 5.1 and later – set variables implicitly from the Fusebox itself. In a Fusebox application the index.cfm template has no use other than to include the framework. The last file on the application root we have to work on is the fusebox.xml.cfm, which is the file that controls all the fusebox circuits, parameters, classes, plugins and global actions. In the “circuits” block we define the paths and aliases for the circuits. You may chose any name as an alias to a circuit, does not have to be the same name of the folder, you will see below that we are calling “cart” the circuit in the folder “shopping”. The “parameters” block contains Fusebox default settings, and it is customizable. With Fusebox, everything is assembled in the root. The index.cfm loads Fusebox and it prepares the request to be served without the customer seeing in which folders the templates are. We added a circuit named “layout” which will handle all the layouts for our application. Since it is for the presentation layer, we do not have to create the “model” folder. Figure 1.7 shows an updated version of our structure. Now we are going to look at the circuit.xml.cfm file placed in all circuits. You noticed that we here we are calling an action on another circuit, the “vhome”, in the “view” part of the MVC, to display the homepage. If we had to calculate anything or grab any information from a database in order to populate that homepage, then we would call the “model” layer before the “view”. The call to “index.cfm?fuseaction=home.main” will get to this circuit which will call the “vhome.main” fuseaction in the “view” area. Subsequently that fuseaction, “vhome.main”, will include the template “dspMain.cfm” with the contents of the homepage, and then Fusebox will assemble the full page for ColdFusion to render to the browser. Note that the attribute “access” for this circuit is set to “public”. That means it can be accessed by the web browser, it is a public fuse. In this case, the “access” attribute is set to “internal” which means this circuit can be only called by another circuit, it will not respond to browser calls. The fuseaction “main” will include the template dspMain.cfm. Now, let’s test the site. If you have ColdFusion Developer Edition installed in your machine, just browse to: “http://localhost/FBtutorial“. You do not have to specify any attributes, because the Fusebox configuration file (fusebox.xml.cfm) will take care of calling the default fuseaction “home.main”. You should get the page “Hellow World”. On the next part we will start handling layouts. I hope you have liked this tutorial and please feel free to comment if you have questions. Thanks to James Husum to point me an error on the Application.cfc, which I already corrected, on line 11 the close comment was HTML and not CFML and caused error. I was looking at your post on the Fusebox MVC tutorial (http://ricardo.parente.us/2009/08/fusebox-5-51-with-mvc-tutorial-part-1/). On line 11 in the code for the Application.cfc template there is a problem if you try to run the code. You need to have a CF style closing comment tag(—>), instead of an HTML style (–>). At least when I was trying it out on my local system it threw an error. This was a very comprehensive explanation and a good start. Is there a part 2 – (n)? Yes, I’m working on part 2 and also on a PDF file with the complete tutorial. I hope I can finish before end of September. I followed your tutorial and thought I would mention that you should point out that the circuit.xml.cfm files cannot be empty for the hello world to work. At a minimum they needed an empty circuit so the xml could be interpretted correctly. I’ve ordered books by Jeff Peters to pick up on fine points, but hope you will continue your tutorials. The logic and organization to your approach is much better than others I have seen. You’re right, I missed that point. 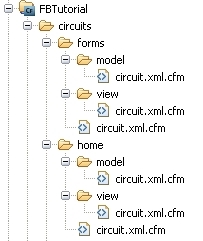 The circuit.xml.cfm files must have the XML (at least with the empty circuit declaration). Thanks for your comments, I’ll definitely continue the tutorial. I’m currently working on the project http://ensina.me/coldfusion which is a translation of the ColdFusion Cookbook into Portuguese for the Brazilian CF Community. I’ll jump back into the tutorial just after that project. Yes, there is a part 2. I just put the link at the bottom of the article. Sorry for the inconvenience and thanks for reminding me. Ricardo…can you pls provide a download version of what you have built? I tried your approach, but its giving me error. I am totally new to Fusebox and liked your approach of keeping model and view folder in each circuit. Thanks for trying this tutorial and commenting. A problem was encountered while reading the circuit file circuit.xml.cfm for circuit mhome. This is usually caused by unmatched XML tag-pairs. Close all XML tags explicitly or use the / (slash) short-cut. i downloaded your code that you give to meghu but is shows same above error. Please can you provide me solution for this error. very very thanks…. I just downloaded the sample code in the second part of this tutorial and it works fine. According to the error you pasted, it seems that you have some strange character in the XML file “circuit.xml.cfm” in the folder “circuits/home/model”. Maybe you got that when you copied the code from the blog. Sometimes the single quotes are showed as a special character. Can we use CFC’s with your configuration. I absolutely love how you use the circuit as the controller, that makes total sense to me. Also, how would we construct XFA’s, would you provide an example for form, link, and ? so I can wrap my brain around your concept? Sure, you can use CFC’s. I usually create a folder ouside the “circuits” folder and call it “components”, where I put all global CFC’s that I can instantiate from any circuit. But there are other ways to use them, like together with the model circuit if it is an action CFC or with the view circuits if it generates any output. The XFA is used to allow you to maintain the logic of your code in the XML, so if you ever need to change the action of a form, or a link, you can do it without changing the code itself, but just changing the circuit.xml file. If you ever need to change the action, just change the XFA in the circuit file. Ricardo, your explanation definitely helps and I am glad we can use CFC’s with your method which makes total sense in my brain. I appreciate your immediate feedback on both of my questions! It’s great to know we have community support. Your tutorials have greatly exceeded my expectations with the framework! From one developer to another, thank you! Ricardo, I have a link and am trying to use Home but it seems to not work. I do have the in the circuit.xml. You are using “#self#” instead of “#myself#”, I believe that’s the problem. Make a test page and do a <cfdump var=”#myfusebox#” /> in one of your templates, and you will see several variables that you can use too, like myFusebox.thisCircuit, myFusebox.thisFuseaction, etc. Thank you for your kind words. It’s a pleasure to help the developers community. I learn a lot from it, so I’m happy to pay forward the little I know.